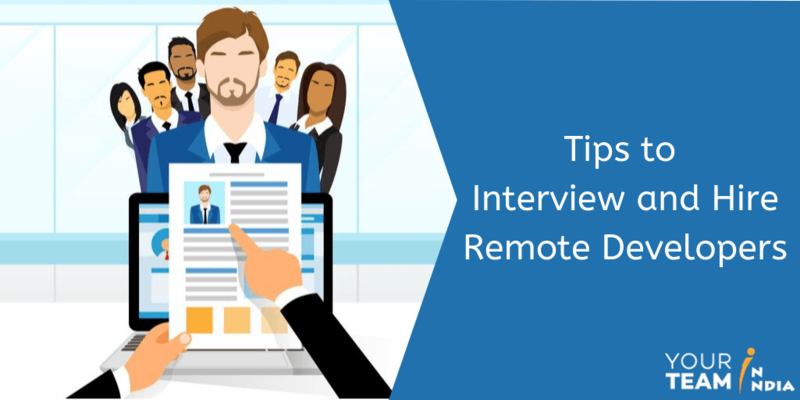 Interviewing remote IT workers is different than interviewing a traditional, on-site person for a permanent position. As a matter of fact, most companies interview the candidates based on their knowledge, technical skills, experience, and overall caliber. However, interviewing an offshore developer also includes scanning their communication skills, commitment, motivational triggers, and tech prowess. In fact, there is a lot more than what usually seems to be the case. Availability, collaborative skills, ability to work independently, the power to solve problems rationally; all these factors should be considered before you hire offshore developers. Well, it may not be possible to understand a prospect completely. Therefore, we have compiled a list of tips to help you hire the right talent & get an efficient remote development team for your project! Though previous remote work experience does not really highlight a candidate’s suitability. It can be useful to understand their comfort level & reliability. You can go through their previous tech work and comprehend if they are a pro or not. It will help you tailor the interview process. If they have the right attitude, skills and prior experience working without on-site supervision, you can move ahead to the next step of the process. Collaboration apps, emails, time management skills, tracking software, messaging apps, video calling and conferencing; these are all important and necessary part of a remote IT workers toolset. It must be made mandatory for all offshore dedicated developers to have these tools. Also, ensure that the interviews are conducted via these to test their tools indirectly. It will help you assess the candidate via cues and check their basic technical capability and ability. Can they operate the tools? Are they comfortable using software that is already being used in your organization by the existing remote IT workers? Do they have minimum tech requirements at their personal workspaces? These questions will help you understand if a candidate is eligible for a successful collaboration. Though many prospects aren’t equipped with an office like setup. Still, you will find a lot of dedicated offshore developers that manage to create quite an acceptable workstation. Even then, make sure that they have some space devoted to work alone. This could be a study table or a corner of their room. This determines their dedication towards the work. In order to hire easy to work with offshore dedicated developers, it’s necessary that you focus on communication and collaboration. These are vital to ensure that a candidate can handle the little issues easily & tactfully; that are bound to crop up the work. Furthermore, managing conflicts with coworkers, subordinates, seniors, and others are critical facts about remote IT staffing. As a recruiter, it’s your responsibility to find out how easily they can handle a situation. Would they be smart and polite enough to settle the issue or do they have a rash approach will make the things worse? A peek into their personal conduct is necessary to evaluate this factor. There’s a common misconception about remote IT workers. It’s that remote workers are excellent multi-taskers, capable of handling their housework, personal lives, and emergencies. While it’s true that many of them can manage and dabble well but it’s not because of their ability. Instead, they are excellent with work management strategies. Moreover, is important that you discuss their time management abilities and other work completion strategies beforehand. Candidates who stick to a schedule call have better work ethics. You may simply ask them questions about how do they manage a tough situation or cope up with stress due to strict deadlines. Their stories of victory can help re-affirm your choice. Most remote workers have a strange problem – their switch on and off time. Some remote workers find it difficult to keep track of time and continue working even after the day is over. On the other hand, some lose track of time and lag at work. Time tracking software is a great way for both kind of remote staffs and their respective managers. Most managers and remote IT workers stick to the tracking software, check their daily, weekly and monthly tasks. Some of them use these software to keep track of the communication, project documentation, and status updates. Passion for a role is often tested by comprehending a candidate’s interest in that particular field. You may be able to gauge a lot from a potential’s curiosity and willingness to learn. It will help you determine whether the prospect is interested in the work. You can find if their ideology matches with your organization or not? You could try to know a bit more about their interests, the blogs they read, the Twitter accounts they follow. These factors reveal a lot about the interest of a candidate. There is no scientifically proven technique to reach the right talent and conduct perfect recruitment. It takes a lot of subjective analysis and evaluation to make it happen. You will first have to understand and define your core beliefs and then search for a candidate who can match your organization’s work frequency. It will help you hire dedicated offshore developers and work with a quality oriented yet an independent and efficient team. In search of a dream team for your project? Need some help in recruiting the best remote workers to work on your dream project. In that case, just drop an email with your requirements at infor@yourteaminIndia and we will bring out the best for you!